Jo Pavey will compete in a fifth Olympic Games after being selected to represent Team GB at the Rio Games. The 42-year-old, who will be the oldest British woman to run in a Games, achieved the 10,000m qualifying time at the European Championships in Amsterdam last week. 'Super Saturday' gold medallists Jessica Ennis-Hill, 30, Mo Farah, 33, and Greg Rutherford, 29, are all in. Christine Ohuruogu, 32, who won gold in Beijing, is selected for the 400m. They are among a team of 80 athletes selected to represent Britain in Rio that will be looking to improve on the haul of six medals in 2012. Athletics team leader Neil Black told BBC Sport: "It's vital to be clear that we have selected Jo Pavey because she has shown form and we believe she will perform at the highest level at Rio." Pavey's place was being challenged by 24-year-old Kate Avery. "It took significant time and analysis but it was about picking the person we thought would perform at the highest level," said Black. "It's a great story and I'm so pleased for her, but I feel for Kate." Dina Asher-Smith, 20, won gold in the 200m in Amsterdam and is picked for her first Olympic Games, as is men's sprinter Nethaneel Mitchell-Blake, 22. 100m: James Dasaolu, James Ellington, Chijindu Ujah. 200m: Adam Gemili, Danny Talbot, Nethaneel Mitchell-Blake. 400m: Martyn Rooney, Matthew Hudson-Smith, Rabah Yousif. 800m: Michael Rimmer, Elliot Giles. 1,500m: Chris O'Hare, Charlie Grice. 5,000m: Mo Farah, Tom Farrell, Andrew Butchart. 10,000m: Andy Vernon, Mo Farah, Ross Millington. 3,000m steeplechase: Rob Mullett. 110m hurdles: Andy Pozzi, Lawrence Clarke. 400m hurdles: Sebastian Rodger, Jack Green. High jump: Robbie Grabarz, Chris Baker. Pole vault: Luke Cutts. Long jump: Greg Rutherford. Hammer throw: Nick Miller, Mark Dry, Chris Bennett. 20km race walk: Tom Bosworth. 50km race walk: Dominic King. Marathon: Callum Hawkins, Tsegai Tewelde, Derek Hawkins. 100m: Asha Philip, Desiree Henry, Daryll Neita. 200m: Dina Asher-Smith, Jodie Williams. 400m: Christine Ohuruogu, Emily Diamond, Seren Bundy-Davies. 800m: Lynsey Sharp, Shelayna Oskan-Clarke. 1,500m: Laura Muir, Laura Weightman. 5,000m: Eilish McColgan, Stephanie Twell, Laura Whittle. 10,000m: Jo Pavey, Beth Potter, Jessica Andrews. 3,000m steeplechase: Lennie Waite. 100m hurdles: Tiffany Porter, Cindy Ofili. 400m hurdles: Eilidh Doyle. High jump: Morgan Lake. Pole vault: Holly Bradshaw. Long jump: Lorraine Ugen, Shara Proctor, Jazmin Sawyers. Hammer throw: Sophie Hitchon. Discus throw: Jade Lally. Heptathlon: Katarina Johnson-Thompson, Jessica Ennis-Hill. Marathon: Sonia Samuels, Alyson Dixon. Men: 4x100m: James Dasaolu, James Ellington, Chijindu Ujah, Adam Gemili, Danny Talbot, Nethaneel Mitchell-Blake, Richard Kilty, Ojie Edoburun, Harry Aikines-Aryeetey. 4x400m: Martyn Rooney, Matthew Hudson-Smith, Rabah Yousif, Jack Green, Delano Williams, Nigel Levine, Jarryd Dunn. Women: 4x100m: Asha Philip, Desiree Henry, Daryll Neita, Dina Asher-Smith, Bianca Williams, Ashleigh Nelson, Louise Bloor. 4x400m: Christine Ohuruogu, Emily Diamond, Seren Bundy-Davies, Eilidh Doyle, Anyika Onuora, Margaret Adeoye, Kelly Massey. Devon's Pavey made her senior international debut in 1997 and competed at her first Olympic Games in Sydney in 2000. She is yet to win an Olympic medal, with her best finish being fifth in the 5,000m in Athens 2004. At the age of 40, she won gold in the 10,000m at the 2014 Zurich European Championships to become the competition's oldest ever gold medallist. Her place at Rio was in doubt after she finished sixth at the British trials in May, but she recorded a season's best of 31 minutes 34 seconds in Amsterdam. She will become the first British track athlete to compete in five Games. Javelin thrower Tessa Sanderson competed in six from 1976 to 1996. 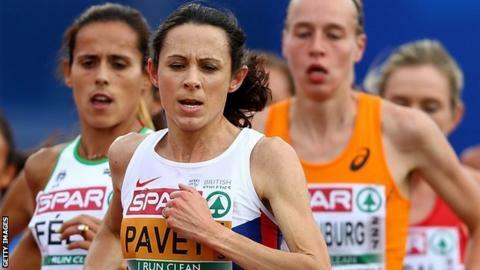 "I was literally in a race against time," Pavey told BBC Radio 5 live. "I was busting a gut in training just to give it one last attempt that could get me even considered really. "I can't believe it, I'm really lucky to be going to a fifth Olympic Games." Pavey said her GB team-mates have started calling her "granny"
Martyn Rooney, who has been selected for the 400m and the 4x400m relay, told BBC Radio 5 live: "To go to my third Olympics, I'm very excited. I'm excited about what kind of shape I'm in. It should be a very prosperous Olympics." The 29-year-old, who missed out on the final of the 400m in 2012, added: "It's an exciting time to be a British athlete. It's a golden year, hopefully." After several golfers pulled out of the Olympics because of fears over the Zika virus, Rooney revealed that his wife and son would not be joining him in Rio. "We decided, not just because of Zika, but the whole safety of the event, it was best that they stay at home," he said. On the controversial topic of golfers pulling out, he added that they may have changed their minds if prizemoney had been on offer. Heptathlete Ennis-Hill, who won gold in London, is relishing the Rio Games. "Everything's coming together now," she said. "If I was able to defend my title in Rio it will certainly be one of my greatest achievements."